My new hosting account with VestaCP comes with compliments of Afreecloud.com. I was sent an e-mail with a login and password, and that was all. No documentation, no step by step guide. This ties in with the Terms and Conditions of Service which stipulates the user to find his/her own way in working with VestaPanel. The challenge begins! A first look at VestaCP was quite confusing. It looked like an index of a kind and was not sure where all of the functions were. Took a while and lots of fumbling for me to finally figure out that the top part was a NAVIGATION PANEL. If one clicks on any of the links it opens with its corresponding Window directly below the navigation bar. I then also found if I hovered my mouse near the top right hand corner of the bottom corresponding Window that it shows some action links. Took a while to figure out that both add on and sub-domains are created in the USER panel. For the free hosting account only one domain/sub-domain is included of course. VestaPanel of course doesn’t come with its own File Manager, which to me as a cPanel user was a big challenge. So more than ever I’d need essential FTP info to upload files with FileZilla. The e-mail with my login and password didn’t include FTP info. So I reckoned that it had to be somewhere in the NAVIGATION BAR, but I couldn’t find a link whatsoever. Nothing in the Navigation Bar. Next I thought it had to be in the USER Panel. Also no FTP link or info in the User Panel. Finally after plenty of searching and nearly giving up I found the FTP Account function hidden right at the bottom of the Domain Editing Window. One has to click on WEB in the NAVIGATION BAR first, then on the domain, then hover the mouse over the right top corner of the bottom section, and click on the EDIT link for the domain. If one then scrolls to the bottom of the EDIT Window, VOILA there is an option to create an FTP account. Felt an enormous relief when I finally found the option! And was totally impressed that I could send the info to my e-mail account. Great stuff! Have to commend VestaCP for at least making the creating of a DBase almost effortless. Much easier than in cPanel. By the time of course when I got to creating a database for my WordPress site, I’d already grasped the VestaCP hide and seek navigation, so was able to find the link for creating the database much easier. What was great is that I didn’t need to create a separate user, and I was able to get the DBase details to be sent to my e-mail. Subdomain DNS delay to propagate! My next struggle with VestaCP happened after I had uploaded my WordPress script files and was ready to install WordPress. When I typed my sub-domain in the address line hoping to get the WordPress Installation Window, nothing happened. Page couldn’t be found. Darn! Then followed almost an hour or more of swotting up how the DNS records work. I Googled it and found some documentation at Servermom.org. That provided a learning curve but didn’t solve my problem. I was reminded of the reason I had ditched VestaPanel in 2014 when I had installed it on my first VPS and was wondering whether that was going to happen again. I just couldn’t get the DNS to work. And then it worked! Turned out that it had been a simple matter of needing the sub-domain to propagate first. Usually with cPanel the subdomain propagates immediately, but with VestaCP one has to give the newly created subdomain some time to propagate first. Whilst still working on the DNS and wondering what I could do to fix it, I discovered that the Domain had finally resolved to the WordPress Installation page. I was in the process of installing my first WordPress site with VestaCP. What a great relief that was! Once I had overcome the initial struggles with getting to grips with VestaCP, setting WordPress up with my hosting account from Afreecloud.com was an absolute pleasure. The hosting account is unbelievably fast, like probably double or even triple the speed of my average free hosting experiences to date. Plugins were installed almost instantly. Just a couple of clicks and I had installed my Twenty Thirteen and Child themes, WordFence and Limit Login Attempts and Duplicator Backup and Migrate Plugins. I also turned off the comments as I usually do, deleted all of the posts and pages as well as plugins and themes that had been pre-installed. Created a few pages and a menu on the fly. All of that in a matter of minutes. I’m almost certain this is going to turn into a favourite free hosting account of mine. I love how fast it works! Thanks Afreecloud and thanks to Xinen at freeVPS.us who introduced our Forum to Afreecloud! Afreecloud passes the Duplicator test! I’m a great lover of the WordPress Duplicator Plugin that allows one to back up and move WordPress sites effortlessly. However, probably because it is as good as it is, it can be quite finicky with how PHP needs to be set up. With cPanel one does get a good idea which version PHP is being used and what options have been selected by the Admin. 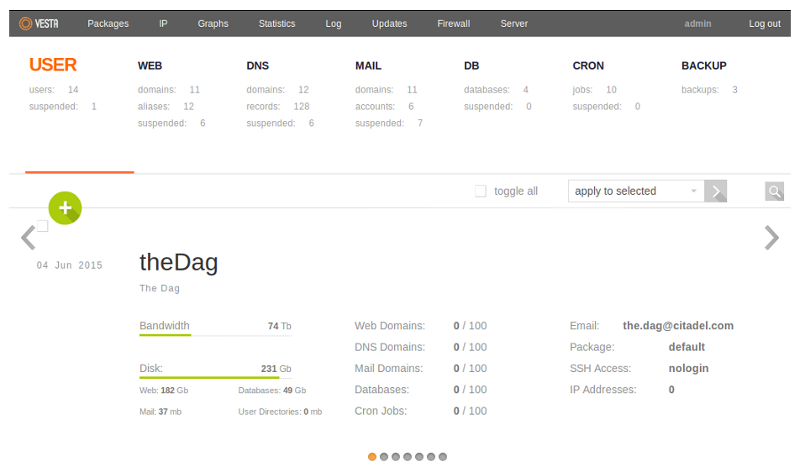 With some cPanel setups one can even enable those options oneself. With VestaCP there is no separate section for PHP and no visible info about its configuration. Closest one gets is when one checks the Domain in the edit window and one can see the basic options that have been enabled for PHP. So of course since this is a very basic free hosting account and VestaCP a very basic panel, I fully expected the Duplicator plugin NOT to work. And then couldn’t believe when it actually worked! First the Backup Process passed the initial test by the Duplicator Plugin dialog Window, then indicated a few problems including the processing time that the PHP had been set up with. I then overrode those, and I’m almost certain the processing time issue was sorted out because of the great speed of the hosting account. I was blown away by the speed with which the backup package was created. Was effortless to download it to my computer as well. I still have to experiment whether I can use the Duplicator Plugin to migrate an existing WordPress site to the hosting account with VestaCP – probably could have done it, although it would have been tricky and I’d have missed out in all of the other learning experiences. Still, it passed the duplicator backup package test, whereas quite a few cPanel free hosting accounts were unable to do so. Mostly because of the way the Admin had set up PHP. Another thumbs up for Afreecloud.com!